Promote your Asia properties or pre-construction projects via our website and email list. Fill in the form to get connected with a real estate agent in Vietnam, Malaysia, Thailand or other countries. Get the exclusive 22-page eBook (PDF) to learn how to buy property in Thailand, Vietnam, Malaysia, Cambodia & other Asian countries. Do you plan to buy property in Vietnam? 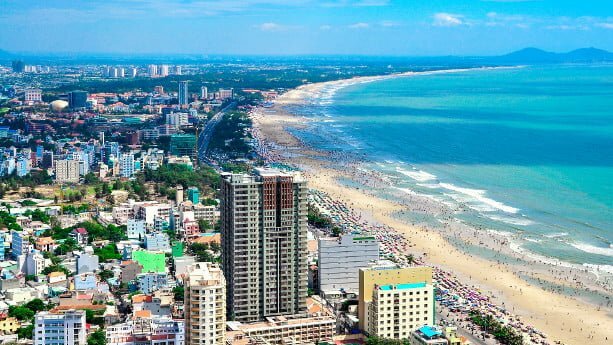 Despite being in the shadow of Da Nang and Ho Chi Minh City, Vung Tau is the preferable weekend gateway for expats, locals and travelers alike who reside in Southern Vietnam, especially Ho Chi Minh City. With improved infrastructure and connectivity, you can reach this harmonious island within 2-3 hours. With a long shoreline, there are a number of condos and condotels that pop up here and there, attracting the attention of property buyers. In this article, I explain the basics you need to know if you’re interested in buying property in Vung Tau. Can foreigners buy property in Vung Tau? The same as it goes in other parts of Vietnam, you’re legally allowed to buy and own condo units in your own name. There’s no restriction to the amount of units you can buy, but foreigners can own a maximum 30% of the units in a condo building. It’s important that you confirm with your agent or developer and assure that the quota hasn’t been filled. Buying villas is also a popular option, where you can lease the land for a period of up to 50 years, even if the government has talked about increasing the term to 99 years. In general, the regulations to foreign ownership is going in the right direction. If you buy a villa, 250 can be owned by foreigners in a given ward. This was not the case before 2015, when the Vietnamese relaxed the regulations to foreign ownership. Why is Vung Tau interesting? Vung Tau is not a sleepy backwater, but actually a city with hundreds of cafés and restaurants, many decide to settle down here for a long time. Want to buy property in Asia? Do you want to buy property in Asia Pacific and need to find a reliable agent? Fill in the form below and we will help you to get in touch with the agency we recommend at the moment. What is your current status? Is the form not working? Please send an email to info@asiapropertyhq.com instead, and we will reply within 24 hours. Disclaimer: We don’t offer any kind of insurance or compensation, due to losses caused by the agency, developer, banks, government or any other party that may be involved in the buying process.